UV radiation can have harmful effects on human skin and eyes, especially during indoor application of high-energy UV irradiators. There is however a positive aspect to UV�s hazardous effect on living organisms. Ultraviolet treatment of drinking and wastewater is a well-established, economical and efficient method for killing germs, bacteria, mold and fungus. Its use is becoming more widespread than traditional water treatment techniques employing chlorine and ozone for reasons of cost and environmental factors. Recently, a field study performed in homeless shelters in New York, Birmingham and New Orleans (TB UV Shelter Study, TUSS) has shown that UV treatment of room air with upper room irradiators leads to a drastic reduction of tuberculosis infection rate. Fig.VI.12. 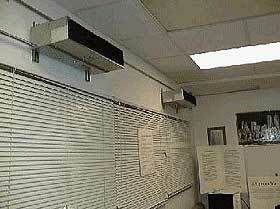 Upper room UV irradiators help lower tuberculosis infection rates. UV-C: 200 to 280 nm (germicidal action, absorption maximum of DNA). Below 230 nm, UV radiation has enough energy to break chemical bonds. Short wavelength high energy ultraviolet radiation in the UV-C spectral range from 100 to 280 nm is used in the germicidal/bactericidal sterilization of air and water. UV-C at 253.7 nm is also employed in eprom erasure and the cleaning of sensitive surfaces in the semiconductor industry. UV curing is another area where UV-C is applied. UV-C Light Sources Due to its high and pre-dominantly monochromatic output at 253.7 nm, low pressure mercury is the light source of choice in these applications. Medium and high pressure Hg as well as metal halide and other broadband UV sources are also used, especially in UV curing. The useful lifetime of high power UV-C sources is limited. 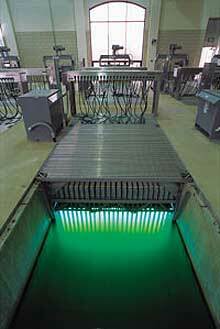 UV-C intensity must be monitored to ensure process control.